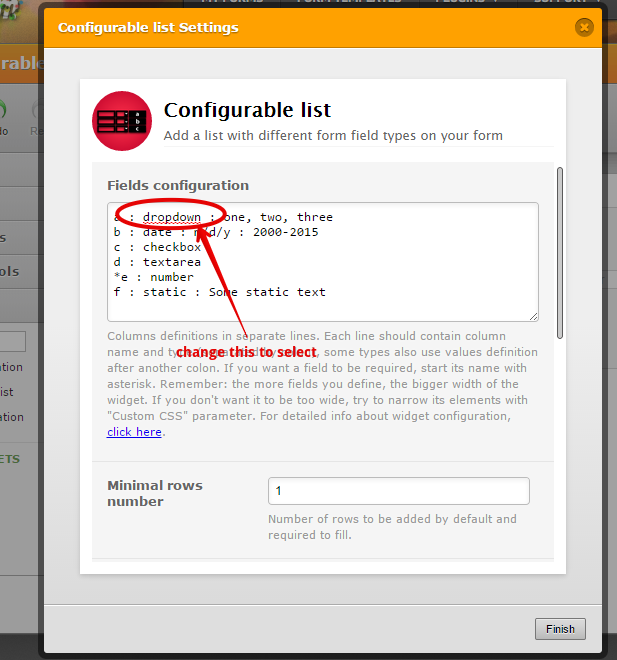 Yesterday the configurable fields on our form worked perfectly. Today they don't. The dropdown menu shows the selections listed in a row instead of a dropdown. When the arrow for opening the dropdown is clicked, the only choice is "dropdown". New fields created on a test form produced the same result, even with the pre-set fields. Also, conditions won't work with the configurable fields. I also was able to reproduced the issue. It seems there is a glitch in the Configurable List Widget when using the dropdown field option. I could not find a suitable temporary workaround except using a separate dropdown field outside the widget. Use the Dropdown field form Form Tools instead. I will submit a bug ticket report to our higher team support so that it can be checked as soon as possible. The solution was on your forum - trick was to use "select" instead of "dropdown". Sorry I missed that before bugging you. Only thing I don't understand is why it originally worked using "dropdown". Thank you for that. The 'select' option do work. But I think it still is a bug because the default is set as 'dropdown'. So I submitted the bug ticket to fix the glitch. Thanks jonathan. Do you think a bug is the cause of the Configurable List Widget's refusal to accept conditions? We will attend to it asap. Hi, thank you for reporting the issue and sorry for the inconvenience that have cause you. We made an update to the widget. 'dropdown' and 'select' should now work just fine. Please confirm if it works from your end, otherwise please report back so that we can further investigate the cause of the problem. Hi, just tested 'dropdown' and 'select'. Both work now. Great!! Thank you for your confirmation and we are glad to see that the issue is resolved for you! Please do not hesitate to get in touch with us if you need further assistance. We will be glad to help.